We have served thousands of satisfied customers and refreshed tens of thousands of carpets in 48+ years of providing superior service to customers on the East Side and throughout the Puget Sound. Just ask us for the name of one of your neighbors. Technicians with Revive Carpet Cleaning have access to the most current training procedures from the Institute of Inspection, Cleaning, and Restoration Certification (IICRC). The facts speak for themselves: 85% of our business comes from our client base. Another 12% comes from referrals from our past customers. If you have a problem, we’ll find the solution. You be the judge. 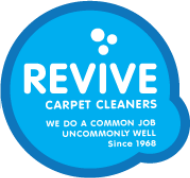 Revive Carpet Services operates under “The Clean Trust.” An IICRC certified technician will be on every job to guarantee that your carpets and upholstery will be cleaned to the highest possible standards of our industry. Can they be trusted in your home and with your furnishings? Your home is your castle, and we go out of our way to respect our clients and their possessions. Revive has developed internal procedures to insure the safety of your belongings. Our core ethics assures that you will receive the most professional cleaning possible from trustworthy professionals on every job. What system do they use? Clean is more than just a word to us. Since 1972 Revive Carpet Cleaning operated the first heavy duty truck-mounted steam cleaning system in the Pacific Northwest and continues to incorporate the latest tools​ and equipment, which allows us to customize each job to assure complete cleaning and quick drying. Your carpets will look and feel new and smell their best each time we drive away. Your complete satisfaction is guaranteed every step of the way. Do they use to quality products? We stay on top of all the latest (and best) products and services available in today’s marketplace through our affiliation with both local and international cleaning institutes. Your carpets will be cleaned by a true professional, with the best equipment without compromises to the environment. Will I get what I&apos;ve paid for? Our guarantee is that you will refer your friends, family and co-workers to Revive Carpet and Furniture Cleaning for all of their cleaning needs. We, the owners, managers, and employees of this firm are proud of our profession and the professionalism we display in the cleaning and restoration work we perform. We are committed to our obligation in providing the best possible service to all our customers. We believe that all our transactions should be fair and honest. We pledge to steadfastly avoid any false or misleading representation of our products or services. We value our place in the community and recognize our responsibilities as local business people. We support the aims and objectives of the Association of Specialists in Cleaning and Restoration and participate in efforts towards advancement of our industry through its programs and services. We therefore subscribe to the Code of Ethics and will conduct our business affairs accordingly. Feel free to give us a call at (425) 222-6037 or simply send us a message!